Subscriptions are a GraphQL feature that allows a server to send data to its clients when a specific event happens. Subscriptions are usually implemented with WebSockets. In that setup, the server maintains a steady connection to its subscribed client. This also breaks the “Request-Response-Cycle” that were used for all previous interactions with the API. Instead, the client initially opens up a long-lived connection to the server by sending a subscription query that specifies which event it is interested in. Every time this particular event happens, the server uses the connection to push the event data to the subscribed client(s). Luckily, Prisma comes with out-of-the-box support for subscriptions. You can subscribe to these events using the $subscribe method of the Prisma client. Enough with the talking, more of the coding! Let’s implement the subscription that allows your clients to subscribe to newly created Link elements. Just like with queries and mutations, the first step to implement a subscription is to extend your GraphQL schema definition. 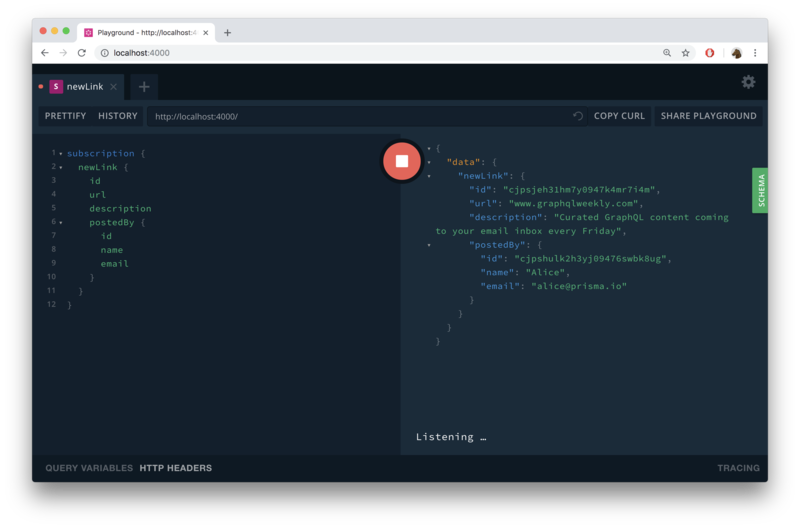 Rather than returning any data directly, they return an AsyncIterator which subsequently is used by the GraphQL server to push the event data to the client. Subscription resolvers are wrapped inside an object and need to be provided as the value for a subscribe field. You also need to provide another field called resolve that actually returns the data from the data emitted by the AsyncIterator. As mentioned, the prisma client instance on the context exposes a $subscribe property which proxies the subscriptions from the Prisma API. This function is used to resolve subscriptions and push the event data. Prisma is taking care of all the complexity of handling the realtime functionality under the hood. With all the code in place, it’s time to test your realtime API ⚡️ You can do so, by using two instances (i.e. windows) of the GraphQL Playground at once. As you might guess, you’ll use one Playground to send a subscription query and thereby create a permanent websocket connection to the server. The second one will be used to send a post mutation which triggers the subscription. In contrast to what happens when sending queries and mutations, you’ll not immediately see the result of the operation. Instead, there’s a loading spinner indicating that it’s waiting for an event to happen. Time to trigger a subscription event. The next feature to be added is a voting feature which lets users upvote certain links. The very first step here is to extend your Prisma datamodel to represent votes in the database. As you can see, you added a new Vote type to the datamodel. It has one-to-many relationships to the User and the Link type. To apply the changes and update your Prisma client API so it includes CRUD operations for the new Vote type, you need to deploy the service again. Thanks to the post-deploy hook, you don’t need to manually run prisma generate again to update your Prisma client. post(url: String!, description: String! ): Link! It should also be possible to query all the votes from a Link, so you need to adjust the Link type in schema.graphql as well. You know what’s next: Implementing the corresponding resolver functions. Similar to what you’re doing in the post resolver, the first step is to validate the incoming JWT with the getUserId helper function. If it’s valid, the function will return the userId of the User who is making the request. If the JWT is not valid, the function will throw an exception. The prisma.$exists.vote(...) function call is new for you. The prisma client instance not only exposes CRUD methods for your models, it also generates one $exists function per model. The $exists function takes a where filter object that allows to specify certain conditions about elements of that type. Only if the condition applies to at least one element in the database, the $exists function returns true. In this case, you’re using it to verify that the requesting User has not yet voted for the Link that’s identified by args.linkId. If exists returns false, the createVote method will be used to create a new Vote that’s connected to the User and the Link. Similar to before, you need to implement resolvers for these. Finally you need to resolve the relations from the Vote type. Finally the Vote resolver needs to be included in the main resolvers object in index.js. The last task in this chapter is to add a subscription that fires when new Votes are being created. You’ll use an analogous approach as for the newLink query for that. Next, you need to add the subscription resolver function. All right, that’s it! You can now test the implementation of your newVote subscription. If you’re unsure about writing one yourself, here’s a sample vote mutation you can use. You’ll need to replace the __LINK_ID__ placeholder with the id of an actual Link from your database. Also, make sure that you’re authenticated when sending the mutation.